"You can build anything – anything that you put your mind to! You can work with other people. It's social. It's just super fun!" he says while focusing intensely on finishing his virtual ice arena with his multi-player team of fellow Minecraft campers in Richmond, Calif. "It's for our ice boat racing." "Rent. Food. Gas. 'How am I doing to get the kids back and forth to school? How am I going to get back and forth to work? ' " says Jenkins, "that's the priority." Children here can see San Francisco from their city and hear all about nearby Silicon Valley and its bevy of industry-disrupting companies, "but they don't imagine they can be a part of that industry," says Jennifer Lyle, the executive director of Building Blocks for Kids Collaborative. This Minecraft camp, Lyle says, is trying to change that 'we're not welcome in tech' feeling some low-income families in Richmond have. "To get people to come here and say, 'No, our child deserves to have access to this,' " she says. It starts by introducing young people and their parents "to the kinds of things wealthier folks get access to because they have the means," she explains, getting "grounding in computers they're not getting in school." And that's troubling, she says, because the PC version is simply a richer version of the game. "It has more options. It has more opportunities to learn to code. And we wanted to make it more accessible," she says. "So he's trying to build an underground tunnel to the other person's arena so he can steal the flag," she tells me. "Those are Ender Pearls. It's like a teleportation," she says. "Minecraft" is the kind of videogame that can seem repetitive and mindless. The player builds three-dimensional virtual worlds with blocks - grass blocks, sandstone blocks, dark prismarine. But "Minecraft" gets high praise for its educational possibilities. Its, quote, "wide-open world" is said to encourage creativity. Eric Westervelt of NPR's Ed team visited a camp in California's Bay Area that tries to make sure all kinds of kids can benefit. ERIC WESTERVELT, BYLINE: In the basement of Richmond, Ca. 's, city hall, just next to the cafeteria and a janitor's closet, 9-year-old Isiah Hammonds is intensely focused on building a virtual ice rink. ISIAH HAMMONDS: I'm in a arena that I made, well, me and my friends made. It's for ice boat racing. Whee (ph). WESTERVELT: "Minecraft" is incredibly popular - think building virtual Lego-like worlds and populating them with people, animals and just about everything in between. I asked Isiah, who's in the third grade, to try to explain why he loves it. ISIAH: It's really fun. And you can build whatever you want. You can work with other people. You can build anything, anything if you put your mind to it. WESTERVELT: A lot of tech summer camps cost upwards of a thousand dollars a week, but these 20 children are in the City Hall basement because the space is free. So is the program, which is run by the nonprofit Building Blocks for Kids collaborative with help from a group called Connected Camps. It serves predominantly low-income African-American and Hispanic children, many of whom face basic barriers to catching the tech and gaming bug. TERESA JENKINS: Access to the Internet, access to devices. WESTERVELT: That's the camp's digital literacy lead, Teresa Jenkins. She says a lot of the children here are playing "Minecraft" for the first time. That's because a lot of the families who come here don't have computers at home, or if they do, she says, they can't afford high-speed internet or it's not a priority. JENKINS: Rent, food, gas - how am I going to get my kids back and forth to school? How am I going to get back and forth to work? That's priority. WESTERVELT: The Building Blocks program is trying to change the we're-not-welcome-in-tech feeling some-low income families in Richmond have, says Director Jennifer Lyle. Children here can see San Francisco from their city, and they hear all about nearby Silicon Valley. JENNIFER LYLE: But they don't imagine that they can be a part of that industry. And so what we're trying to do is introduce young people and their parents to the kinds of things that, you know, wealthier folks get access to because they have a means. UNIDENTIFIED WOMAN: Double click on the TeamSpeak 3 client. 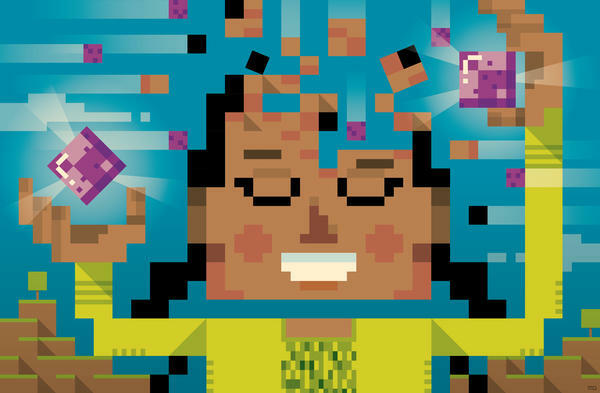 WESTERVELT: "Minecraft" can be used to teach the foundations of coding, animation and more. Children can absorb the broccoli of computer literacy while reveling in the popcorn of building elaborate worlds out of cubes. But to really get that full experience, kids need the PC or Mac version of the game, a verison not all have access to, says Morgan Ames. She's a post-doctoral scholar at UC Berkeley who helped create this camp and has studied its impact. MORGAN AMES: Generally, we found that middle and upper-middle-income kids play the PC version more. Boys tend to play it more than girls. And in general, white kids tend to play it more than children of color. And we found this troubling because we found the PC version a richer version of Minecraft. It has more options. It has more opportunities to learn to code. And we wanted to make it more accessible. WESTERVELT: For children like 9-year-old Jaiden Newton, who's conspiring with her brother. JAIDEN NEWTON: So he's trying to build a underground tunnel to the other person's arena so he can steal the flag. WESTERVELT: What are those in the sky? Those are really cool. JAIDEN: Those are ender pearls. It's like a teleportation. WESTERVELT: How long have you been playing "Minecraft"? WESTERVELT: As program director Jennifer Lyle puts it, we're sending a message to parents, schools and Silicon Valley - we belong here. Eric Westervelt, NPR News, Richmond, Ca. (SOUNDBITE OF C418'S "DROOPY LIKES RICOCHET") Transcript provided by NPR, Copyright NPR.